A great behind the scenes look at Season 1 of Alias, my favorite TV Show of all time. :D I found it at our library's used book sale so it was a steal and quite fun to breeze through. Quite a trip down memory lane. It makes me want to get my DVDs back from a friend and watch them all again. Alias Declassified: The Official Companion is an all-access, behind-the-scenes look at the first season of this hit ABC television series. Author Mark Cotta Vaz walks the reader through the making and development of the show; from the creating of set designs and costumes, to the fight choreography, to the adding of digital effects and music. And featured throughout are dozens of interviews with the cast and crew, along with concept art and production photos. Also included, is a complete episode by episode guide highlighting the gadgets, the Rambaldi mystery, and the missions. However, as an “authorized” companion, the focus is mainly on promoting the show and at times it gets a little carried away with praising the actors and production team. 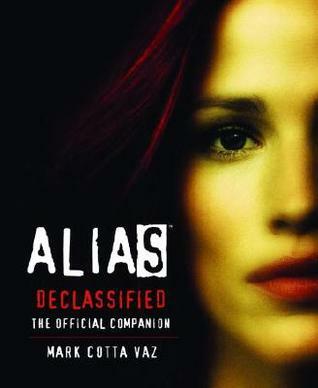 Still, Alias Declassified: The Official Companion is an informative and revealing look at what goes into making this extraordinary television series. This is a really detailed playbook for the entire first season of Alias. Included are mini interview quotes from cast members as well as behind the scenes members, all who bring the show to life. In addition, we get a companion DVD, storyboards of some famous scenes and lots of pictures of all the awesome costumes (including hair and makeup) made for Jennifer's character. I recommend this for anyone but especially Alias fans. Best have for any alias fan. I could not put this book down. I just love the show - it goes along with. Mark Cotta Vaz - Mark Cotta Vaz is the author of over twenty-one books, including four New York Times bestsellers. His recent works include Mythic Vision: The Making of Eragon, The Spirit: The Movie Visual Companion, and the biography Living Dangerously: The Adventures of Merian C. Cooper, Creator of King Kong, which was a Los Angeles Times bestseller.